The term Internet of Things (IoT) has become ubiquitous in recent years and is now seemingly being applied to any instance in which a device is connected, communicative and data-driven; whether it is a smartphone, fridge freezer or car. However, it is arguably the manufacturing sector that stands to benefit the most, with the Industrial Internet of Things (IIoT) envisaged as a positive force for change that is already beginning to see the introduction of sophisticated robotics in the workplace and smart components that communicate their own assembly instructions to the production line. The challenge for equipment suppliers is that companies are now moving beyond talking about the theory behind Industry 4.0 to wanting to know how it can and will be applied in practice. To highlight this, the International Data Corporation recently published research estimating that global IoT spending will total nearly $1.4 trillion by 2021, with manufacturing predicted to be the leading industry for investment. As one of the world’s major industrial energy sources, which is estimated to account for 10 per cent of all energy used in industry globally, compressed air will undoubtedly have a significant role to play in shaping the smart factories of the future. But, you may ask, what is being done now within the compressed air industry to embrace the fourth industrial revolution? Here Stef Lievens, Business Line Manager for Compressor Technique Service Operations at Atlas Copco Compressors UK and Ireland, looks at the history and application of internet connectivity and data science in the compressed air industry and examines how it may influence both the initial design of the equipment and the way it is monitored and managed in working environments. The concept of adding intelligence to air compressors by connecting and enabling them to communicate over the internet is not new. In fact, as of today, Atlas Copco has over 100,000 connected compressors operating at more than 35,000 customer sites in the world. These compressors are delivering in excess of 150 data measurements per second. This is proving vital, on one hand in enabling data mining engineers to intelligently analyse performance patterns and, on the other, by helping design teams to apply the data in the development of new and more customer-suited compressed air technologies. For some time now, smart controller technology has enabled plant managers to keep track of how their compressor is performing via MODBUS or PROFIBUS internet connections to a central plant management system. These types of control system are effectively the ‘brain’ of a compressor: collecting data via built-in sensors, processing it and then delivering plant managers with an overview of how their compressed air system is performing. 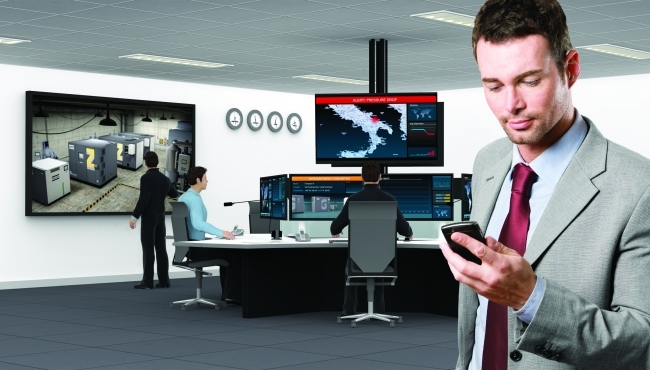 More recent advances have enabled compressor controllers to be connected to mobile devices, tablets and smartphones through systems such as SMARTLINK, which facilitates remote monitoring over a secure network. The end result is that operators can keep track of key parameters including pressure, flow, motor and dryer speeds and then make adjustments when necessary via a compressor’s manual interface. This enables varying production demands to be accommodated and can help plant managers improve efficiency and save energy. The next conceivable step is to take this final, manual stage out of the hands of compressor operators by enabling air compressors themselves to track and make process improvements autonomously as independent cyber physical systems. Research is being undertaken to develop this type of technology in the future. However, for the time being remote condition monitoring is the most tangible example of a fledgling IoT technology that is already having an impact in the compressed air industry. Indeed, there have been such major leaps forward in this area that is has led to the creation of a new sub-set of the Industry 4.0 movement known as Preventative Maintenance 4.0. In the realm of compressed air technology, the major development in preventative maintenance has been the introduction of technology that combines hardware with customisable data monitoring software. This enables maintenance and service engineers to remotely track indicators such as specific energy and compressed air pressure calculations so that immediate improvements can be made when needed. During this process data is gathered, compared, and analysed; and, when required, warnings can be sent out in order to prevent downtime and to allow local service providers to plan and prepare their interventions. Analysis of available data has proven that uptime is greatly improved on regularly serviced compressors and can make a difference of 3.5 per cent to a compressor’s availability. 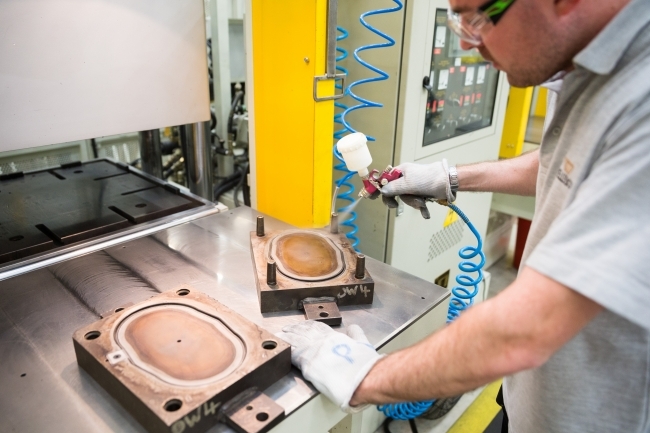 This may not sound high at first, however as it equates to an additional 210 production hours over the course of a year, based on a compressor running for 6000 hours per annum, the potential business benefits quickly become clear. Knowing the status of compressed air equipment at all times is the surest way for plant managers and maintenance professionals to spot any developing problems, uncover potential energy savings and achieve maximum uptime of both compressors and the production lines they support. These insights can be realised through a remote data monitoring system, which is illustrated by a number of recent use cases. For instance, when a period of cold weather caused a cereal manufacturer’s compressors to run at a particularly low ambient temperature, a remote data monitoring programme picked up warnings from the units’ electronic condensate drains and triggered a visit to the site by a service engineer. This early intervention saw the customer fit temporary heaters to prevent the drains freezing up, which could have led to compressor element damage, condensate reaching the air network, and substantial breakdown costs. In another user case, a remote data monitoring system picked up an instance where the element temperatures were inefficiently high in all of the compressors at a steel manufacturer’s site. On inspection, a service engineer found that the compressor room was poorly ventilated, leading to a temperature of +400C in the room. A complete re-design of the compressor room was recommended. In the meantime, service engineers made sure the compressor coolers were kept clean and the oil was topped up to prevent overheating. 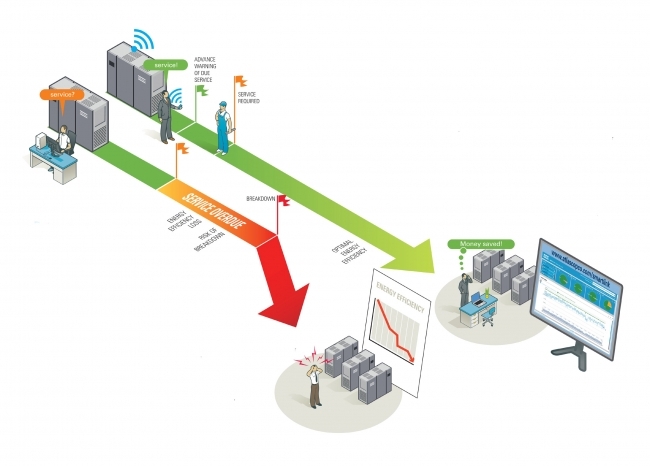 The SmartLink solution is divided into three options: Service, Uptime and Energy. SmartLink Service enables the user to easily schedule maintenance visits as they have an overview of machine data and the time left before a service is due. The second option, SmartLink Uptime allows the end user to be informed by email or SMS message if there is a problem with the compressed air production. Without this safeguard the user has to be alert for warnings on the compressor system but even daily checkups do not offer 100 per cent security. Based on the SmartLink information, the necessary actions can be taken to avoid the risk of a breakdown − and it is possible to visit the website at any time to see the actual warning/shutdown status of the machines as well as a history of previous notifications. Finally, SmartLink Energy enables the continuous monitoring and analysis of the performance and energy efficiency of a compressor installation.